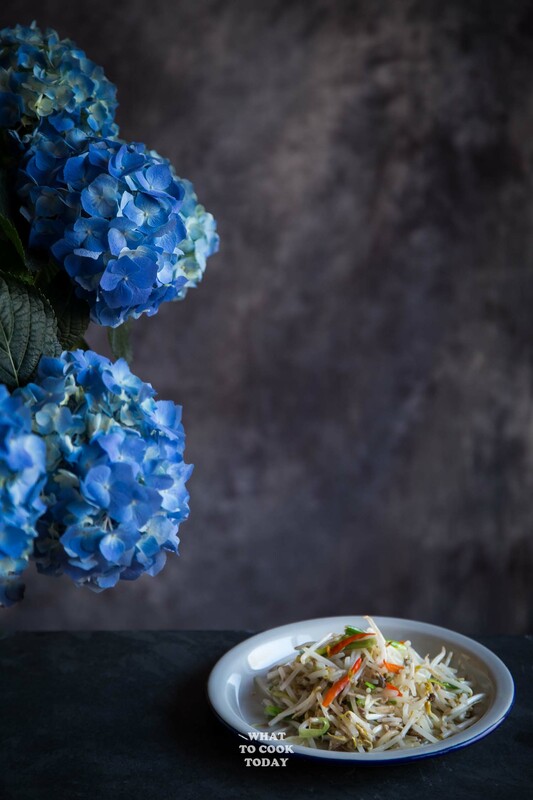 Tumis tauge ikan asin / Bean sprouts with salted fish – Crisp fresh bean sprouts are sauteed with umami-rich salted fish is popular side dish in Indonesia. One of the dishes that mom made so often when we were kids was this tumis tauge ikan asin. It’s my brother’s favorite. Mung bean sprouts or known as tauge in Indonesia is cheap and nutritious. It is a common side dish serve as part of Asian multicourse meal. The variety of salted fish alone in Indonesia is amazing. From big fish to small fish and different kind of fishes. You name it. The fish is usually dried and then cured with salt. Back in the old days, it was done to prolong shelf life because refrigeration is not available. Salted fish is extremely salty and usually used as part of “seasonings” in Indonesian and many Asian cooking. I got this salted fish in oil from Asian grocery store. I didn’t know it’s available until the owner of the store recommend it to me. 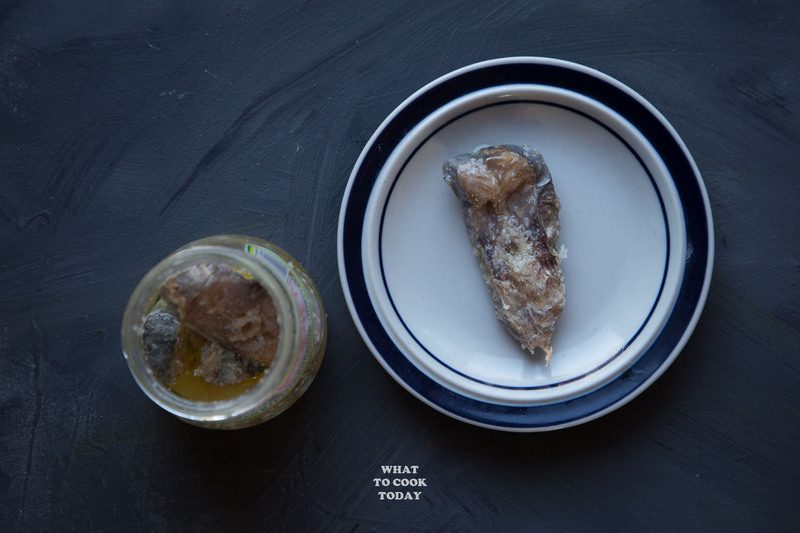 This is salted mackerel stored in oil. My mom typically use the dry version, not store in oil, but i couldn’t find any near me. This is just as good though. When cooked, salted fish gives that umami flavor to your dish. ALWAYS use fresh bean sprouts. I’ve seen canned or pickled bean sprouts available, but you never want to use that for beansprouts stir-fry. EVER! Those aren’t meant for stir-fry. I know it can be a struggle trying to keep fresh bean sprouts fresh. 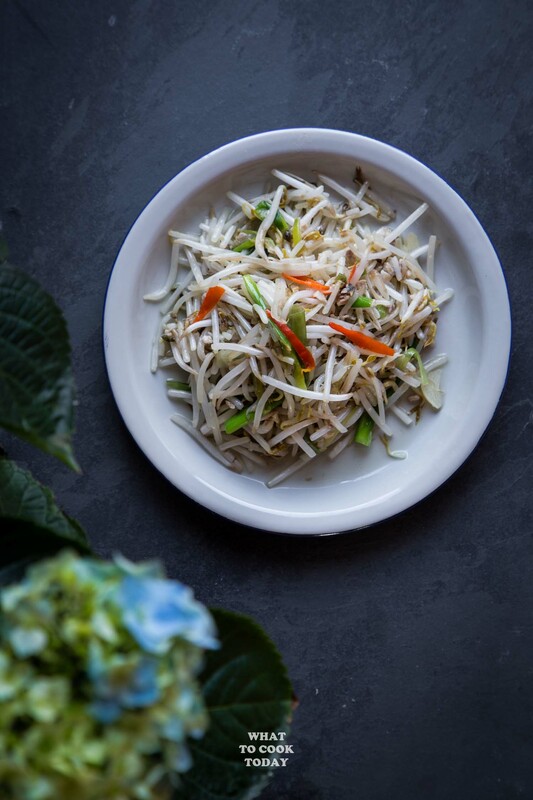 Read how to keep bean sprouts fresh longer. WHAT ELSE CAN I STIR-FRY BEAN SPROUTS WITH? They go pretty much with everything. If your intention is to prepare it as a side dish like in this tumis tauge ikan asin, you can use extra firm tofu cubes, veggies like bell peppers, tomatoes, green beans, long beans, tempeh, dried shrimp. Just to mention several! No matter which combination you choose, always remember beansprouts usually is added last because they cook super quickly! 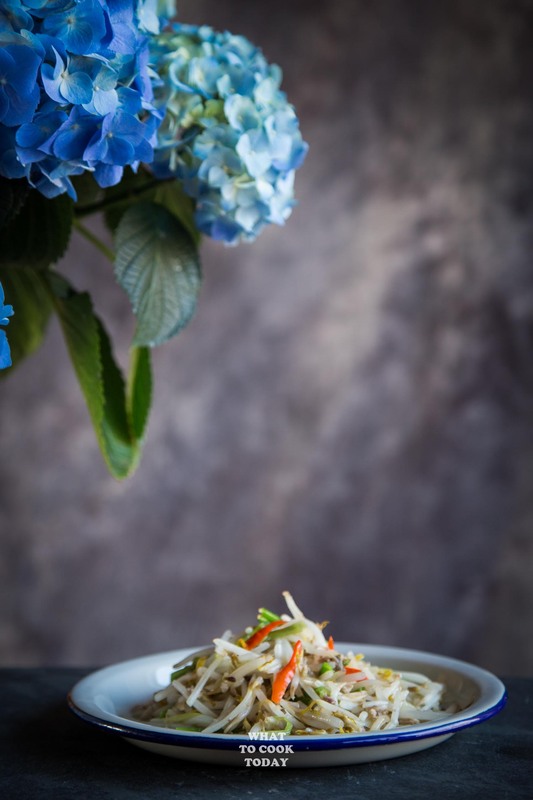 Crisp fresh bean sprouts are sauteed with umami-rich salted fish is popular side dish in Indonesia. You can use dried anchovies (ikan teri) if you can't find salted fish. They aren't exactly the same, but dried anchovies is a suitable substitution. Salted fish are two magic words to me! You have no idea:) Every time I have visited a market in Vietnam or China I’d buy a hundred grams each of all kinds of salted fish and/or sun dried/salted little river crabs etc. Then I’d go to the hotel, sit by the pool, order a beer and munch on my bounty. It is like crack cocaine for me! Soo good. 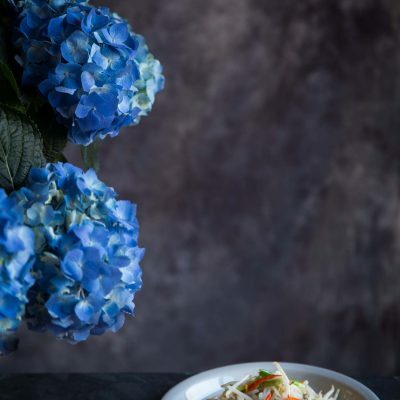 At the Asian market near us they sell salted fish and shrimp – I assume they are for cooking as you say and sometimes I do use the tiny shrimp (after rehydrating and then toasting in a pan) in rice or soups or in green papaya salad. But honestly – the fish (anchovy sized etc) I eat for snacks. People who know what do use them for probably will think me savage, lol. I should learn some recipes with them (but will continue to eat them straight from the package). I am loving this recipe! 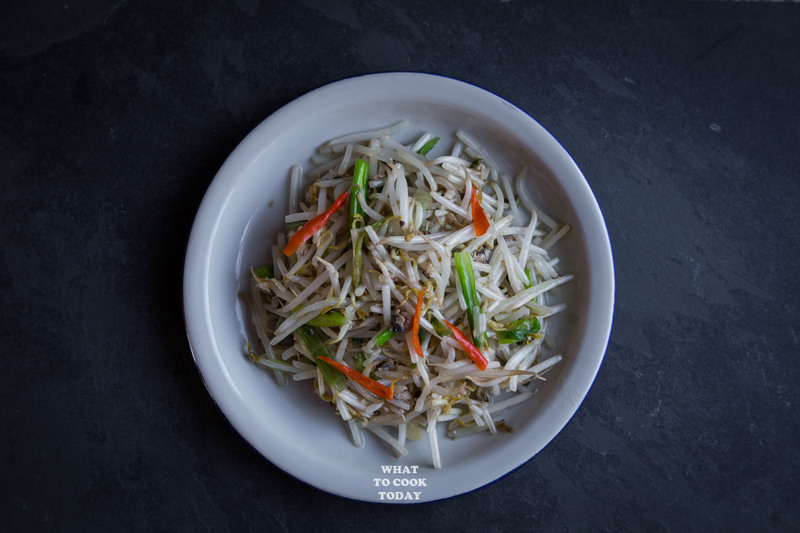 Bean sprouts are so good when stir fried and just the thought of doing so in the company of salted fish is super exciting! Just think of all the beer I can drink with it. Now I am actually craving Tiger, because it is my go to when I travel.